do you think this episode is somewhat related to a war movie like Saving Private Ryan, All Quiet on The Western Front or The Hurt Locker? Could the detour be Crawl or Code? Perhaps Brawn or Brain? Lots of better World War I theme movies, such as: A Farewell to Arms, The Fighting 69th, Grand Illusion, Hell's Angels, The Lost Battalion, Paths of Glory, Sergeant York, and What Price Glory? Wire Crawl vs Wire Comms? Barbed Wire vs Telegraph Wire? Does it look like an overnighter to Verdun, and a staggered start at the chateau? She says, "The war is over, vive la liberté." Do we have this location matched in GE?? Could that mean they have already done the RB?? It could just be an envelope. What color are the Speed Bump clues? I did not think they were red. And if the Detour is after the Roadblock, it gives the U-Turned team very little time to overcome their extra "challenge". But if they are in the Detour and have a RB clue...they they have already done it, right? So speedbump, RB, Detour, UTurn....right?? 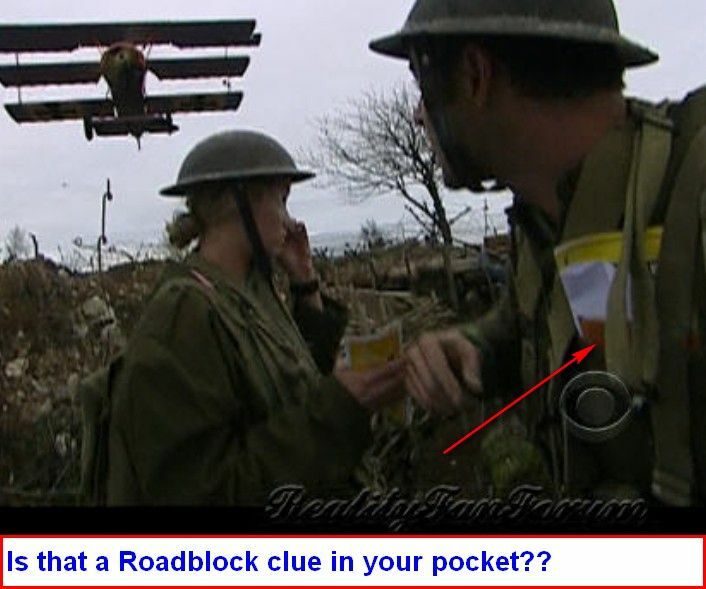 I'm quite unsure, but I don't think that is a Roadblock clue. It's possible, but I don't think so. Anyone else can clarify? 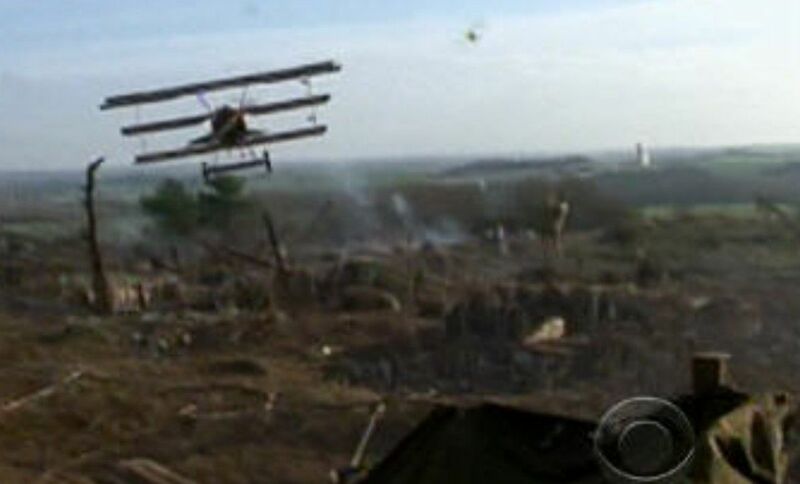 The battlefield may not be too far from an airport (for the triplane). i love that G-Man...did you create that or find it somewhere? And then they could send their Morse code message! I get the idea that the crawling also involves avoiding being "hit" by the enemy...paint ball?? I wonder if getting hit by a paint ball means you start the crawl over?! CBS so needs to hire us!! Good job!! Could the mustache be part of bike uniform task? No one is seen wearing one in the battle vidcaps. I think the Biking is transportation to roadblock/pit stop. Never would have gotten it: Massiges, looking southwest. Main de Massiges is about 1 km north of the village. We are NOT visiiting this again YY...fair warning.